Freedom Air was a low cost airline of Air New Zealand Group with its main base at Auckland Airport. 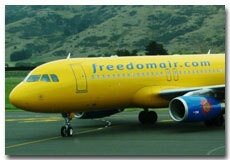 Freedom Air used to provide scheduled passenger services to domestic destinations of New Zealand, Australia and Fiji. Charter flight services are also operated within New Zealand. Freedom Air was founded in 1995 and started its flight services with one Boeing 757. With the expansion of its fleet in 2004, Freedom Air started air flight services to many cities of Australia. In March 2008, the air services of Freedom Air are ceased by Air New Zealand Group.